Canned beans are high in fiber, vitamins and antioxidants and are also an easy-to-store and convenient staple for any pantry. 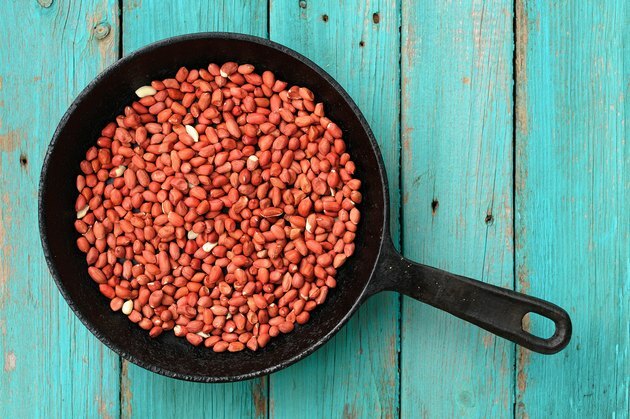 Frying canned beans is a quick and simple way to heat them through without adding a lot of fat or calories. Cooking canned beans in a whisper of olive oil keeps them from sticking to the pan while adding some heart-healthy omega-3 fatty acids. You can cook canned beans with almost any combination of spices, herbs, vegetables and maybe a little meat for flavoring and come out with a surprisingly pleasing result. Open the bean cans and pour the beans into a mesh strainer. Canned beans are often packed with a lot of sodium and oil, so draining them helps cut down on their sodium and fat content. Rinse the beans well in cool water and let them sit in the mesh strainer for three to five minutes to drain. Heat a skillet over medium-high heat for 30 to 45 seconds. Add just enough olive oil to coat the bottom of the skillet. Let it heat just until you can smell the oil's scent. Put the drained and rinsed canned beans into the hot oil. Fry the beans for five to seven minutes, stirring occasionally, until they are heated through. Mash the beans with a fork or potato masher if you’re making refried beans. Add chopped onions, garlic, chopped chili peppers and herbs to your fried beans for a spicier result. Never try to cook beans in a can because it could explode.